The City Palace is a jewel in the crown of Jaipur City. The structure is a smooth amalgamation of the Mughal and Rajasthani architectural styles. It a major landmark of the Pink City. The City Palace was erected by Maharaja Jai Singh II. Subsequently, the successive rulers made several changes. The City Palace is a seven storied structure. The imposing palaces and the palatial halls that exist inside the City Palace contribute to its beautification. 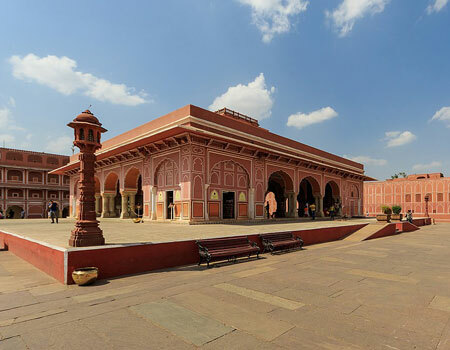 The palace houses the City Palace Museum which showcases the best of art and weapons of the Rajputs. Another section of the museum contains costumes of the former kings and queens of Jaipur. As soon as the visitor enters the first courtyard of the palace he can see the Mubarak Mahal constructed by Maharaja Madho Singh II. A glorious gateway from this courtyard leads to the Diwan-I-Khas (Hall of Private Audience). The two large silver vessels present here have secured a mention in the Guinness book of World Records. Diwan-I-Aam (Hall of Public Audience) charms the onlookers. Chandra Mahal, literally meaning the Moon Palace, is the prime highlight of whole of the City Palace. Its interiors are adorned with beautiful paintings and the floral decorations. Sukh Nivas (Hall of Rest) constitutes the drawing room and the dining place. The fourth floor has the Shobha Nivas (Hall of Beauty). It is embellished with mirrors and enhanced with mica decorations. As the visitor moves on to the fifth floor he enters the Chavi Nivas (Hall of Images). A stunning view of the surrounding regions is available from the sixth floor the City Palace. Mukut Mahal (Crown building) is the uppermost floor. Around Badal Mahal, the visitor comes across Govind Devji Temple which is a must-watch. The City Palace has great historical importance. The structure reminds the onlooker of the rich past of rajasthan. The City Palace is a symbol of royal elegance.